In the midst of growing FundApps, I gave far less time to charity than I’d have liked. Despite the generous volunteering policy we established, at a personal level my charity amounted to a few small donations, a little micro-finance, and some occasional volunteering. I countered this feeling of ‘I should do more’ with a vague notion. That is, if against all the odds we successfully exited some day, I’d finally look into which charities really do have meaningful impact and donate a portion of the proceeds to them. When my co-founder Andrew introduced me to Founders Pledge, the concept totally clicked for me. I could turn my vague plan into a legally binding personal commitment in a matter of minutes. Even better, when the time (hopefully!) comes to donate they’d help me figure out the most effective charities to support the causes I care about. At the time of writing they’re now close to $1 billion dollars pledged to charity by founders at all stages of company growth. They are funded independently, so there’s no cost to pledgers or the charities. Their evidence-based approach to selecting charities appealed and opened my eyes to the world of effective altruism, giving cause for reflection on the existing charities and micro-financing I had been backing. Perhaps it’s not the british thing to shout about giving but if you’re a founder with a similar itch, do go check them out. Author james.crowleyPosted on January 6, 2019 January 7, 2019 Categories Startups and BusinessLeave a comment on Have you taken the Founders Pledge? A friend of mine recently went to his head of HR to arrange shared parental leave. They had no clue how the process worked, asked him how he was going to cover the work, and warned that it might not be possible. My friend had to calmly point out that this was in fact their problem, not his – and that he was legally entited to take his leave regardless. So what? 12 weeks isn’t particularly generous. This change is about building a workplace of inclusion and equality for all parents. We’re a 40-person bootstrapped company, so 12 weeks is what we can achieve at the moment. The aim is to increase that when we can. What about after 12 weeks? Presumably this question was mainly from our US audience, but to be clear this is in addition to any statutory leave (up to 12 months in the UK for mothers). What about more flexibility? The flexible options might seem loose because it is – almost everyone in our company works flexibly in some way. We have part-time team members, adjusted hours, adjusted days, working from home, sabbaticals etc. If that means staggering work, job-sharing, setting up remote arrangements, we do this now and would want to speak to our new parents about what will work best for them. Also, mentioning our pay gap. We have an hourly earnings gap. Many things have negatively influenced that over time. None are excuses. We are improving it and will keep doing so until it’s gone. I’d love to hear how your own company is approaching this. I wrote my last post about remote working on my way to Gran Canara almost 4 years ago. It was the first time I had attempted to work remotely from the team based in London, and the reality was – remote working was really hard! We aren’t a “remote-first” company, and I knew working with the team when they weren’t used to having to deal with a remote team member was going to be challenging. Even a slightly flaky internet connection became massively frustrating during calls. Reverse engineering context from discussions that were happening ‘offline’ was a constant challenge. And trying to engage the team in the work I was doing from Gran Canara. On the plus side, there were no time-zone differences, I met some awesome people, we redesigned the FundApps branding, and I was living one minute from the beach! However, the challenges of growing a team in person in London were enough that I hadn’t really attempted it since. Roll forward several years, and FundApps has grown from 8 to approaching 50, has offices in London and New York, with remote workers in Toronto, Darlington and Auckland. A decent video conferencing set up. Sounds obvious, but it took us much experimentation to find something that worked for us. We’re now using Zoom and a proper speakerphone that works over USB too. If someone has a dodgy connection, they can join the call by phone instead. If there’s one remote person in a meeting, then everyone joins a call from their desks. We don’t do this for everything yet, but it does level the playing field significantly. Face to face time is invaluable, particularly for new starters. Our remote workers had the advantage of having worked in our office for some time – they knew the team, and the culture. Our recent recruits in New York didn’t have that luxury though, and so making the time for them to visit London, and their colleagues visiting New York to build those relationships have been super valuable. Increase signal to noise. We’re trying to separate discussion from actual decisions so it’s easier to keep track of what’s going on – we’ve had some success using dedicated project channels in Slack (for chat), while ensuring core decisions are recorded more explicitly in GitHub or Google Docs. Preferring async communication, if you have team members working on different time zones – try finding a time that works for folks in Canada, London and New Zealand for a call! Licensing SQL Server in AWS? It’s up to twice as expensive as Azure or Rackspace Cloud. … and regardless of cloud provider, it’s (probably) costing you 2x what it would on dedicated kit. So AWS could be costing you 4x what it would cost to license on dedicated hardware. Disclaimer: I am certainly not a SQL Server licensing expert, nor that much of a cloud expert. The purpose of this post is to hopefully prove that I am, in fact, wrong. Please help with this! Anyone that’s ever head to deal with SQL Server licensing (or indeed any kind of Microsoft licensing) knows what a minefield it is. In the public cloud, all your worries go away (ahem) and you can just wrap the license fee in the monthly cost via the hosting providers “service provider license agreement” with Microsoft. Looking into it further, however, I realised there are actually big discrepancies between how much the different cloud providers charged you for licensing SQL Server itself. In other words, your costs to license SQL Server could be 2x higher than Azure or Rackspace Cloud, and 4x higher moving to AWS cloud from dedicated hosting (see dedicated vs cloud). At the moment, I have no good explanation for this. I’m still waiting for a response from AWS, and I’m hoping that I’m missing something here. To head off the obvious — I realise there are databases with more cloud-friendly licensing. Unfortunately real life gets in the way, so we’re stuck with SQL Server until we can migrate away from it. If you’ve got this far, I’m assuming you want some detail, so here goes. I am only considering SQL licensing costs, not the cost of the underlying hardware. For cloud providers that don’t explicitly state a licensing cost (only Azure does this), I’m going to take the cost of a Windows VM with SQL Server on it and subtract the cost of a Windows VM. I’m just looking at monthly pricing with no commitment, as that’s how we’re currently paying for our dedicated kit too. Rackspace has different UK pricing in GBP, but I’ve spot checked the numbers and there was no material difference from their USD pricing, so we’re just going with that. I have taken the prices from these locations: http://www.rackspace.com/cloud/public-pricing http://azure.microsoft.com/en-gb/pricing/details/virtual-machines/#Windows, http://azure.microsoft.com/en-gb/pricing/details/virtual-machines/#Sql, and http://aws.amazon.com/ec2/pricing/ (as of 22 Jan 2015). Medium isn’t the best place for displaying tabular data, so I’ve included an image below, and you can download the spreadsheet here. 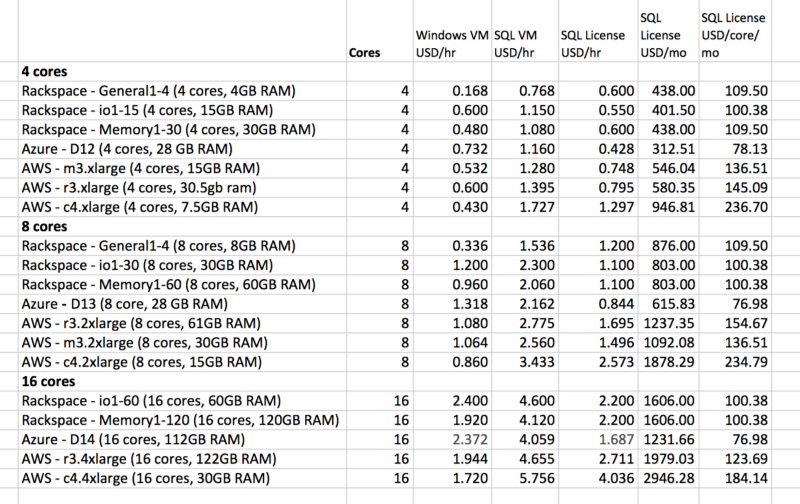 Azure is the cheapest, working out around $75–80 per core (regardless of VM, as they list their SQL prices separately). I’m assuming this is essentially cost price, as I’ve been told elsewhere that a 4 core license via the SPLA scheme is generally $300/month. Not surprising, given it’s Microsoft licensing their own product. Rackspace Cloud is more expensive, but very consistent, working out between $100 per core (regardless of VM), so a 25% markup. As a note of comparison, on our dedicated kit, we pay £420/month for a 6 core license, which works out at £70/$106 USD so this is consistent. AWS is the big surprise here, with prices ranging anything from $136 at it’s cheapest to $236 (m series followed by r series, followed by c series). That’s a whopping 70%-195% markup. I mentioned earlier another price differential moving to cloud. Regardless of which cloud provider you’re using, SQL Server will (probably) cost you 2x what you’re paying for dedicated kit. That’s because SQL Server licensing ignores hyper threaded cores (PDF) on dedicated kit, but not on virtualized kit, assuming you are only licensing the VM and not the host itself. So if you’re running in a virtualized environment with hyperthreading turned on (Azure, AWS, Rackspace Cloud, for instance), you have two virtual cores for each real processing core, and so you’ll need to pay for twice the number of cores to get the (vaguely) equivalent performance. Like I said at the start, I’m no licensing expert, but given the already painful SQL licensing costs, seeing the huge differences we’d be paying in AWS vs other cloud providers is a hard pill to swallow. Please let me know if you spot any mistakes in my calculations! It would certainly push us away from SQL Server even faster than we were planning, but in the meantime… would be interested to hear any insights as to why there are such big variations and such a huge markup at AWS! Author james.crowleyPosted on January 22, 2015 August 6, 2018 Categories Software Engineering, Startups and BusinessLeave a comment on Licensing SQL Server in AWS? It’s up to twice as expensive as Azure or Rackspace Cloud. As some of you will know, I’ve run the developerFusion community for many years now, as a part-time hobby. Now, some big changes are afoot! 2 months ago I packed in my day job to focus on the site full-time, and have now made the first big step and re-launched the site. You can check it out at http://www.developerfusion.com/. This is just the first step along the road, but an exciting one (for me at least!). The new site is going to make it even easier for developers around the world to connect with each other, and discover what’s going on in their local area – be that events, user groups, blogs or just general discussion. We’ll also be bringing a wider range of technical articles and focused developer news. If you have any feedback, feel free to get in touch – the site is here for you! If you twitter, stay tuned at http://twitter.com/developerfusion for more updates. Forgive me for sounding my own trumpet, so to speak… but this is a significant milestone for me! Developer Fusion has reached over 500,000 unique users* in the last 30 days, which is great news, and the first time it’s broken this (albeit artificial) barrier. Next target: 750,000! Many thanks to everyone who helps out or participates in the community. I’m really hoping running the site can become a full-time thing now, which should loads more useful features for all our visitors. In other news, after a few teething problems (ie, pulling my hair out for the last 48 hours), the forums are now using Community Server 2.0 RC1 – keep an eye out for the final release from the Telligent team on 20 Feb. Great stuff!